A SOUL HELD CAPTIVE… One October morning in 1932, Vicente Sorolla entered the white house on the hill and was never seen again . Now, Detective Dori Orihuela witnesses his brutal murder in her nightmares. Drawn to this tough but tender woman, Vicente materializes out of her butler's pantry and asks her to find his lost love, Anna. Dori wonders if she's not only about to lose her badge, but also her sanity. Instead, she learns how to live and love again from a dead man who becomes her friend. LOST IN THE LIGHT takes us back to the wild days of Prohibition when whiskey could make a poor kid into a king, and turn a nice girl into a woman who can stand on her own feet. 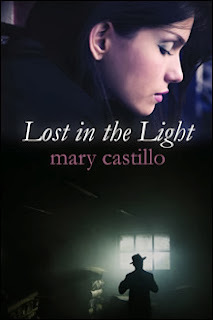 Mary Castillo's latest novel weaves romance, history and mystery into an eerie, humorous, touching and unforgettable story. Detective Dori Orihuela is recovering from what US Law Enforcement describes as a ‘Righteous killing’ [OK, put that down to my diet of US Cop shows] She is also the owner of a 120 year-old Edwardian mansion in dire need of a restoration; a job she cannot afford but the builder happens to be an ex-boyfriend still sufficiently besotted to give her a hefty discount. Still suffering from flashbacks, when Dori has an image of a man being beaten to death in her house, she puts it down to mental instability. However, the ghost of Vicente Sorolla is not to be dismissed so easily. Murdered in 1932, he needs Dori's help to find a woman named Anna. Vicente is disarmed by Dori’s 21st century tough cop/strong woman attitude but quickly learns to like and respect her. The story shifts back and forth from present day to the thirties prohibition. The author handles both ages very differently, in that Dori’s life is peppered with humour, and the angst of a single, independent woman, plus cynicism in equal measure, while Vicente’s life was gritty, hard and provided scant happiness. The story showed how a Mexican boy with few prospects could get caught up in the world of organized crime, but it is done in a pragmatic way and no one is sorry for Vicente, especially himself. Dori talks about her Mexican background, the details and attitudes of which I found interesting without being overly sentimental. I loved the fact Dori’s family lived slightly nefarious lives - i.e. when she learned her great-grandmother was a ‘laundress,’ she says that the only thing that lady probably laundered was money! This novel kept me turning pages as there are so many questions to be answered. Will Dori and Gavin get back together again? What happened to Anna and can Dori help Vicente? Will Dori ever mend her fragile relationship with her mother? And will Meg the lonely librarian contribute something to this mystery or is her role to make a play for Gavin and make Dori jealous? This book is a paranormal mystery, with a little romance thrown into the mix, and an excellent read. I didn’t miss a heavy romance element as the action, plot and story arc was great. There are some questions that never get answered, for instance, is Dori the first person Vicente has enlisted since he died? I received a complimentary copy of this e-book in exchange for an honest review.